I have made it!!! 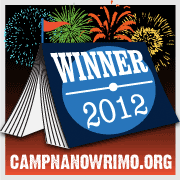 Five years ago I would have really been rejoicing at reaching 50,000 words. I did in fact. Five years ago was the first time I had actually written anything that long and the first time I finally proved to myself that I could take a story line and extend it into near novel form. After several years of rinse and repeat I learned and I realized that 50,000 words is nowhere near the total word count for my genre. I need to write between 80,000 and 95,000 to get closer to what fans of fantasy and paranormal romance expect. The bad news? I won’t make 85,000 this month. With the launch of Fae Hunter and all the promo along with it there were a few days of zero words being written on Fae Guardian. However, I am back in the saddle again. I am writing a consistent 1,000 to 2,000 words a day and I will finish this first draft in the next few weeks. This entry was posted in On Writing and tagged Camp NaNoWriMo, fae, Fae Hunter, fantasy romance, indie writer, NaNoWriMo, On Writing, paranormal romance, Self-Publishing, urban fantasy. Bookmark the permalink.